I actually got a lot of things worked on for Sew&Tell this week. I guess not going anywhere has it’s perks. This week I worked on a few little projects that still need some working on. Creamie’s window treatments are almost done, I just need to pick up the last few things. I did get this cutie apron finished for my neice who just turned five. Every girl needs a ruffly apron and I hope she likes it! This one isn’t reversible because it was mostly from my stash and I didn’t have another fabric to go with it. Purple usually isn’t my color, but this purple was left over from Creamie’s nursery. I also have this new little stack of fabric that is ready for something wonderful. Scott gave me the brown pear Kokka print for Christmas, and I have been trying to find just the thing to do with it. It’s only a yard (he found it on ebay and that was all they had). I think I have this project mostly figured out, but it just looks so pretty all spread out! I can’t wait to start (but am always wary about cutting into fabric I love even when I know I am going to keep it at my house when it is finished.) I just need to find another choclatey brown FQ that isn’t a polka dot. Of course, when I go shopping I better only take $3, otherwise you wind up with 20 FQ in your bag and a couple of yards of this and that. I was originally going to make this print into a bag, and took it into the quilt shop to find a lining. Big Mistake. Of course, it has a happy ending. Go check out the other Sew&Tell’s, it is one of my favorite parts of starting the weekend. What awesome colors! I love the way you’ve paired them in the apron and the triangles are over the top scrumptious! These colors look perfect together with the Kokka print! I am sure the purple apron will be well loved. Love the Farmers Market material in the apron! I am sure she will love it! Those large scale Kokka prints are hard! I love what you are doing here and it may inspire me to use my sunflowers. That apron is sooo cute! The pears project looks great. Your fabric selection is gorgeous. Wow super cute, and hello i don’t know where i was when you posted your babes nursery pics, LOVE IT! seriously amazing! ooh..That is awesome! I realllly love the pears in brown. Where were they when I was buying the pear prints? LOL! I can’t wait to see how this one turns out! That pear fabric is fantastic. Your apron is sweet and very girly! That is one adorable apron!!! Love the paisley print with the purple. But I have to say, I am totally in love with those pears!!! Yummy, and the fabrics you chose are spectacular. Thanks for sharing. That apron is adorable!! Speaking of FM I scored some of the aqua and pink dahlia print and I love it person even more than I thought I could! Now what to do with it. I want to be able to look at it for a LONG time. I have a problem cutting into fabric too. And i know why you have so many bent pins! I do the same thing (sewing over them…). darn, I don’t know why but I can’t see your pictures. I’m sure the apron is adorable though. Wish I could see it all. I’m like you, I don’t throw anything out. I save all my teeny scraps in one bag to use as filler for pillows and such. Wow, the quilt is going to be so great! I love the pear fabric and brown/teal combo. Can’t wait to see it come together! 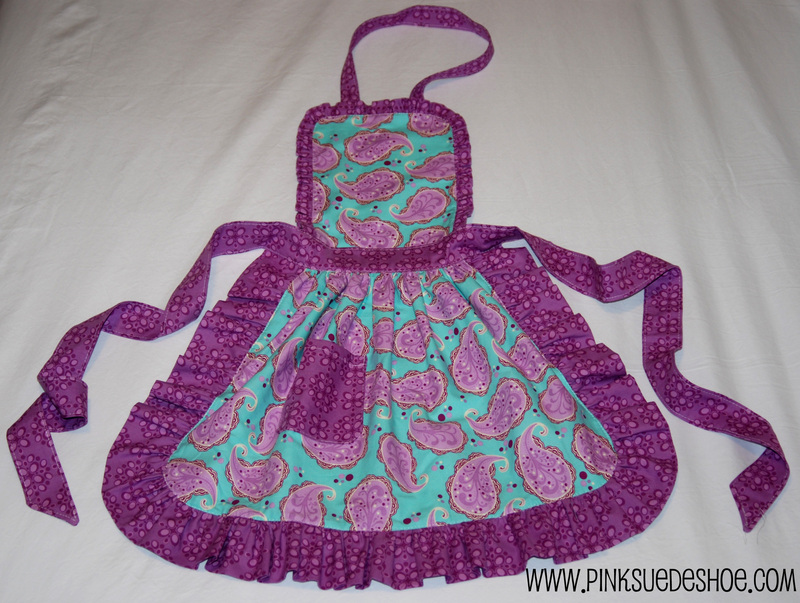 I love the apron, the ruffles and paisley are great! Your pear and triangle project is going to turn out to be quite beautiful! I can not even handle the pear fabric and its potential border! That is fabulous! Love purple!!!!!!!!!!!! The pears are great too! Thanks for sharing the finish. The apron is absolutely adorable! I’m sure your niece will love it. 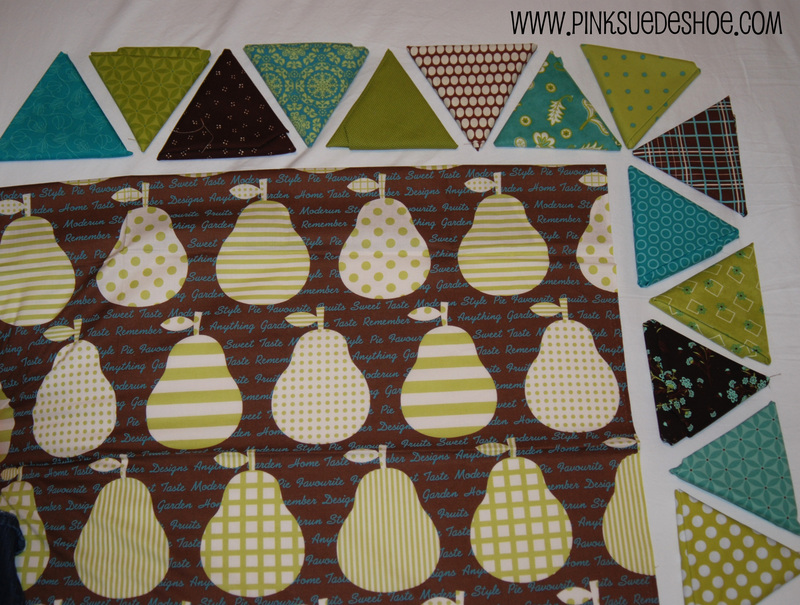 I love the colors for the brown pear quilt … it’ll be lovely! The puple apron is perfect for a five year old. She is going to be thrilled. The layout for your next project it fabulous. I love the fabrics and the colors.